For the past decade, Mike Eckroth has made a name for himself as a highly accomplished sideman and bandleader in New York City. With a resume ranging from artists such as John Scofield’s New Quartet, Ralph Irizarry and La Voz De Tres to his highly creative and eclectic studio projects with Chulo Records, Eckroth has proven himself a musician able to thrive in many formats. 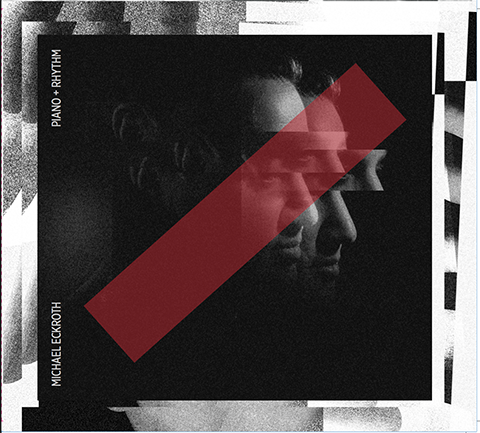 His most recent effort, simply titled Piano & Rhythm, is both a nod to the piano masters of the past as well as a showcase for Eckroth’s own identity as a composer/pianist. He divides the record in half, with the A-side being a collection of other composer’s songs and a B-side of his own. Accompanying him on this recording are various combinations of many of the best musicians New York has to offer. The A-side is a thought-provoking journey through the many historical faces of Afro-Cuban piano from both sides of embargo. From Rafael Ortiz Rodríguez’s robust “El Plato Roto”, Clare Fischer’s quirky “Western Airlines” to the nostalgic sounds of Arsenio Rodríguez’s “Guaragui” and “Atomo Musical” by Orquesta Arcaño Y Sus Maravillas, each incarnation of Eckroth’s group nails the vibe of every tune organically and beautifully. Bud Powell’s “Un Poco Loco” features notable solo contributions from Andy Gonzales (bass), and the stacked percussion section of Ralph Irizarry (timbal), Pedrito Martínez (conga) and Johnny Rodriguez (bongo). Besides Eckroth, Johnny Rodríguez is the only other musician that appears on nearly every track and also played the role of producer for the album’s A-side. The B-side takes a complete U-turn into the modern arena with mixed meter originals such as “Franklin's Riff” and the startling “Mulato Blanco”. “Leon's Pants”, with a melody somewhat reminiscent of the Clare Fischer’s and Cal Tjader sound, soon kicks into a solo section that churns in a way that is unmistakably New York in nature and features a notable solo by flautist Itai Kriss. Throughout the recording, Eckroth weaves one statement after the next with his unerring improvisations. His solos exhibit a deft sense of strength, control and clarity, never ambiguous or meandering. His moments of calculated restraint leave the listener in suspense, waiting in anticipation for what he has to say next. What is especially interesting is Eckroth’s ability to morph his playing to fit the stylistic objective of each composition, playing ideas that are always appropriate while retaining a natural sense of assurance and personality that is very much his own at all times. He not only speaks the language of the idiom, but also has something of substance to say all the while. Piano & Rhythm is a strong musical offering crafted by one of New York’s most skillful and versatile pianists. The diverse choices of repertoire and musicians and careful attention to detail are highly apparent. In all, it makes for an album that succeeds in taking the listener on a genuine journey of where Latin-jazz has been, where it can go and how well it can be done along the way.